Kathryn Wylde, deputy chair of the New York Fed's board, challenged state Attorney General Eric Schneiderman's opposition to a proposed $8.5 billion settlement between Bank of America and a group of investors -- leaping to the defense of the financial industry -- according to remarks quoted Monday in The New York Times..."I'm just appalled," said Whalen, who is managing director of Institutional Risk Analytics. "She is a public director of a Federal Reserve Bank, and she's not supposed to behave this way. She is not an advocate for the industry." "If she wants to be an advocate for the big banks," he continued, "then she ought to step down." (Maryland Attorney General) BALTIMORE, MD - Attorney General Douglas F. Gansler has announced that the Consumer Protection Division has issued a final order requiring Bay Area Design & Build, Inc. and its principals to refund $10,000 collected from consumers to construct a home in Anne Arundel County and pay a penalty of $3,000. The Division found the builder and its principals, Gregory Louis Haigis and Robert Scott Huff, violated Marylands Custom Home Protection Act by failing to place or maintain money in an escrow account, failing to have a surety bond to protect those deposits and payments and failing to construct the home. 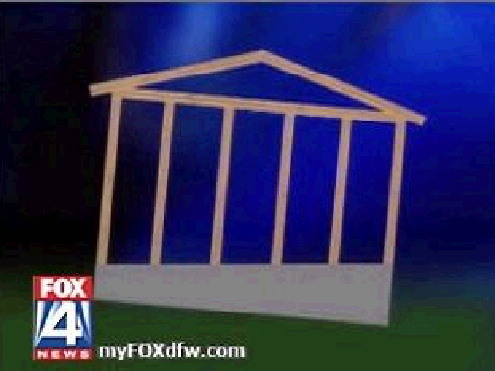 A Houston lawyer with a small firm won an $8.5 billion settlement with Bank of America tied to the 2008 mortgage mess, a deal that could establish a road map for other banks in resolving the nation's stubborn housing crisis. "I think this is one of those rare opportunities for doing good for your client and doing good for the public," said Kathy Patrick, lead attorney for 22 big investors hit by losses from Bank of America and its Countrywide subsidiary. The settlement, announced Wednesday, not only would require Bank of America and/ or Countrywide to pay $8.5 billion to cover investor losses caused by problem mortgages, but it also would force a series of improvements in the way borrowers receive service when they need to reset terms or otherwise work out problems with individual loans  alleviating a source of friction and frustration. The settlement will contribute to a second-quarter loss of $8.6 billion to $9.1 billion, or 88 cents to 93 cents a share, the bank said in a statement. Bank of America also said it's adding $5.5 billion to a liability reserve for future loan-repurchase demands and will record $6.4 billion in other charges including legal costs and a write-down of mortgage-unit goodwill... Investors, which also include Pacific Investment Management Co. and the Federal Reserve Bank of New York, demanded in October that Bank of America repurchase home loans that had been packaged into bonds by Countrywide Financial Corp., which it acquired in 2008. The settlement covers 530 mortgage trusts with an original loan balance of $424 billion, the bank said. Bank of America, the largest U.S. bank by assets, "significantly hindered" a federal investigation into the firm's faulty foreclosure practices on potentially billions of dollars worth of taxpayer-backed loans, a federal auditor told an Arizona court. The bank withheld key documents and data, prevented investigators from interviewing bank employees... Federal investigators found one bank employee who signed more than 75,000 foreclosure documents over the two-year period. If the employee worked every day during those two years, that amounts to about 103 documents signed per day, or one every five minutes. Another Bank of America employee was found to have signed nearly 47,000 foreclosure documents over the examined period, which amounts to about 64 documents signed per day, or one every seven minutes. 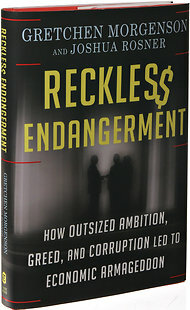 By GRETCHEN MORGENSON and JOSHUA ROSNER This article was adapted from Reckless Endangerment: How Outsized Ambition, Greed and Corruption Led to Economic Armageddon, by Gretchen Morgenson, a business reporter and columnist for The New York Times, and Joshua Rosner, a managing director at the independent research consultant Graham Fisher. The book is to be published on Tuesday by Times Books. The New York attorney general has requested information and documents in recent weeks from three major Wall Street banks about their mortgage securities operations during the credit boom, indicating the existence of a new investigation into practices that contributed to billions in mortgage losses. The possibility has also been raised that the banks did not disclose to mortgage insurers the risks in the instruments they were agreeing to insure against default. Another potential area of inquiry  the billions of dollars in credit extended by Wall Street to aggressive mortgage lenders that allowed them to continue making questionable loans far longer than they otherwise could have done. The conclusion by prosecutors that Mr. Mozilo, 72, did not engage in criminal conduct while directing Countrywide will likely fuel broad concerns that few high-level executives of financial companies are being held accountable for the actions that led to the financial crisis of 2008. Hundreds of billions of dollars have been lost by investors while millions of borrowers have lost their homes. Few of the people who ran the institutions that contributed to the disaster have been found liable. The Obama administration has advocated closing government-backed mortgage providers Fannie Mae and Freddie Mac. The New York Times' Gretchen Morgenson says the U.S. government still has an important role to play when it comes to home ownership. Related article:Gretchen Morgenson's New York Times Piece, "Imagining Life Without Fannie And Freddie"
Details of the subpoena might make more than a few powerful people nervous. This is the first time anyone has sought records regarding all government officials who may have benefitted from the so-called "Friends of Angelo" and other VIP programs that Countrywide had. Congressional investigations have revealed Countrywide extended favorable terms to powerful shakers-and-movers in government in hopes of wielding influence. VIP mortgages were also given to President Clinton's former Housing Secretary Henry Cisneros, and President Bush's Housing Secretary Alphonso Jackson. Jackson's daughter even got VIP loan status when an internal Countrywide e-mail noted her father "is expected to be confirmed as Secretary of HUD."